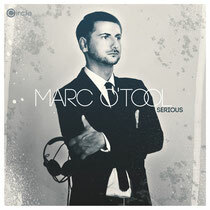 Germany’s Circle music release Marc O’Tool’s third LP this month – 11-tracks of new material entitled ‘Serious’. Marc’s history in electronic music goes back a long way, his beginnings as a promoter pushing the likes of Garnier, Daniel Bell and Jeff Mills in Germany’s North Rhine-Westfalia was the perfect start point and proved to be a catalyst to a career that has spanned over two decades. Whether DJing, producing, engineering or running a label, O’Tool has managed to be prolific while never compromising on quality. A key proponent of the maturing progressive house scene in the late-90s, O’Tool established himself as a great talent. ‘Serious’ see’s the Essen-born producer delivering smooth, sumptuous melodies across its ten tracks. From the nagging melodies of the opening cut, ‘Intro’, ‘Serious’ is a celebration of deep and tech house laced with old school touches and ultra-modern production. Whether in a low slung, moody temperament like in the creeping vocal cut ‘Feel So Good’ or the rave-fuelled ‘ Party-1994’, he grips the groove perfectly. Vocals feature prominently throughout ‘Serious’ which add additional character to the fluid, key heavy works and most notable about ‘Serious’ is its structure. From start to finish it’s an LP that is both cohesive and varied while never straying far from firm house roots. Deft programming and a measured use of each of the individual track’s characteristics results in an immersive and entertaining listen that peaks perfectly. With 11 tracks in total, it’s out 30th March.